There are several processes that can be used to refine oil. The oldest way is through distillation, which involves heating up the crude oil slowly, allowing the different hydrocarbons to boil off one at a time, and then collecting them as vapors. There are also newer chemical refinement methods that can use a chemical reaction to convert one type of hydrocarbon into another. 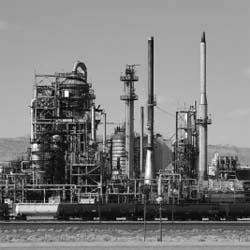 Oil refineries like this one can either refine oil through distillation processes or through chemical methods.